Daphne Miller, MD, set out on a nutritional adventure around the globe to understand why some indigenous populations live healthier lives. Along the way she made some astonishing discoveries, which she published in The Jungle Effect. 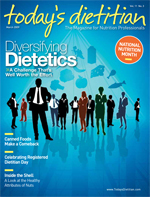 Daphne Miller, MD, is one of those doctors whom dietitians flat-out adore. Fit and enthusiastic, she has a passion for food, nutrition, and keeping her patients healthy through lifestyle. “As a family physician, a lot of the work that I do day in and day out is helping people to make positive lifestyle changes. There is a lot of focus on changing diet and exercising,” says Miller, who maintains a private practice as a family physician in San Francisco and is an associate professor at the University of California, San Francisco, where she teaches nutrition and integrative medicine. It was this challenge of helping her patients find long-lasting success with a healthy lifestyle that prompted Miller to explore new vistas in food and nutrition and share her story with others. Miller’s inspiration for her nutritional journey came when Angela walked through the door of her San Francisco medical office. Angela was born in Rio de Janeiro, Brazil, to a mother of Italian descent and a father whose ancestors were Maués Indians. Her mother liked to cook heavy meals, and Angela recalled being overweight and tired as far back as she could remember. When she was 8, Angela’s parents separated, and she went to live with her father’s relatives in the rainforest, where she played and ate fish soup, taro, beans, and fruit. She lost weight and felt good. But when Angela returned to Rio, her weight and lack of energy also returned. After high school, Angela moved to New York, where she continued to gain weight and feel fatigued. By the time she moved to San Francisco in her 30s and made an appointment with Miller, Angela had suffered through many weight loss diets and doctor consults, yet she was overweight and borderline hypertensive and had pain in her knees. Miller collected some of the traditional recipes and passed them on to Angela, who started eating her childhood “jungle diet” and enjoyed weight loss and renewed vitality. Miller had a breakthrough: Perhaps these indigenous diets had something to teach people about health. “In general, the places that have intact indigenous diets have healthier people. I began to sort through the literature, picking out places around the world with what I call ‘cold spots’—places with low rates of chronic diseases. I focused on colon and breast cancer, cardiovascular disease, and depression,” she says. The concept for her book The Jungle Effect was born. Miller’s book is not your everyday nutrition read. The author didn’t conduct all of her research for the book from her cozy office in San Francisco. She traveled to cold spots around the world—canyons, deserts, islands, frozen lands, and jungles—to learn more about how indigenous diets affect health. The Jungle Effect brims with real-life stories that come all the way from Miller’s waiting room in San Francisco to villages around the world. She gathers the everyday problems her patients experience, such as prediabetes and obesity, and crosses the globe to explore cold spots where these problems occur far less often. Miller then takes readers to local villagers’ kitchens, farms, hillsides, and tables to sample their indigenous food culture. From picking wild greens on the hillsides of Crete to exploring a Copper Canyon antidiabetic home garden, Miller delivers nutritional nuggets in a shimmer of travel and adventure. It’s no surprise that populations migrating to the United States find themselves mired in nutritionally related chronic diseases, including obesity, diabetes, heart disease, and cancer. Dietitians see this in their practices every day. In her book, Miller explores the “migration effect,” as well as the effects of modernization on populations that have never left their small villages. She traces “authentic” recipes to see how they have changed over generations. For instance, Miller takes a look at her own Ukrainian grandmother’s recipe for borscht, which was made with canned sweetened beets, generous amounts of sour cream, and store-bought chicken broth. But in her grandmother’s hometown of Chodorov, borscht was prepared using fresh grated beets, light chicken stock, salt, pepper, and a dollop of yogurt or clotted cream. The effects of modernization can be seen in indigenous diets around the world. How did these cold spots develop indigenous diets that are formulas for health? It’s not as if their early ancestors understood how to highlight nutrition superstars such as fiber, omega-3 fatty acids, monounsaturated fats, and antioxidants. Throughout history, our ancestors relied on internal guides to determine which foods nourished them; thus, they slowly developed an indigenous cuisine. They passed down the knowledge about which plants made them healthy, how to cultivate foods, food-related customs and rituals, and which foods were appealing. The sources of their foods were local, natural, and unprocessed. Animals were fed on open pastureland and used sparingly with nothing left to waste. And there you have the power of indigenous diets. This is a far cry from the way people eat today in Western societies, as they become influenced by media, experience a lack of food traditions and rituals, and feast on a surplus of modern, processed foods. Refined foods are often filled with sugars, salts, and artificial ingredients. Meat supplies can come from animals raised in pens, fed manufactured feeds, injected with antibiotics, and given hormones. Vegetable oils are extracted, thanks to modern technology, resulting in an abundant supply of cheap oil that has upset our omega-6 to omega-3 fatty acid balance. Miller believes there are valuable lessons to be learned from the cold spots she travels to in The Jungle Effect. Along her journey, she shares a collection of observations, tips, and research highlights that can easily impact Americans’ way of eating, no matter where they live. Miller also includes a collection of indigenous recipes to introduce the flavors of cold spots from Copper Canyon, Crete, Iceland, Cameroon, and Okinawa. The first destination readers take with Miller is to Copper Canyon, Mexico, one of the most geographically inaccessible locations on her journey. Miller considered Copper Canyon because of her pursuit to understand the type 2 diabetes epidemic, which is dramatically affecting Latinos, Asian Americans, Native Americans, and African Americans. Remarkably, Copper Canyon, home to more than 50,000 Tarahumara Indians living in remote communities deep within the canyons, is a cold spot for diabetes. “The Tarahumara Indians of Copper Canyon are also called the Mexican Pima. They are blood relatives of the Pima Indians of Arizona. The Tarahumara have some of the lowest rates of diabetes compared with the [Arizona] Pima, [who have] some of the highest rates of diabetes in the world,” Miller explains. In the kitchens and farms of Copper Canyon, Miller discovered a bounty of local foods: corn, beans, squash, eggs, chicken, chiles, herbs, spices, nuts, berries, wild greens, cactus, seeds, oranges, tomatoes, avocados, and occasional wild game or fish. On the island of Crete, Miller began her search for the foods that protect against heart disease. The heart-protective qualities of the Mediterranean diet have been well documented since Ancel Keys began his landmark Seven Countries Study in 1958. In Crete, Miller toured an olive farm, hunted for horta (wild greens), sampled whole grain rusks, sipped grape must, and came to an interesting conclusion at the end of her sojourn. Miller’s travels took her to Iceland for a surprising reason: This cold island nation is a depression cold spot. Once in Iceland, she mingled with fish farmers and sheep; sampled wild game, fresh milk, and wild berries; and found very few vegetables for the eating. Miller says, “In Iceland, there are disproportionately low rates of seasonal affective disorder, depression, bipolar disorder, and postpartum depression. When you consider its northern location, this is remarkable. They eat more fish per capita than anywhere in the world. Even Icelanders [who] don’t eat fish have very high omega-3 fatty acid levels. Whatever they eat, even lamb, has high omega-3 fatty acid levels. The lamb eat the tundra grass, which is high in ALA [alpha-linolenic acid], which converts into EPA. Even the wild berries are high in ALA, and the milk is high in omega-3 fatty acids. They are literally bathing in omega-3 fatty acids by eating wild foods. They have a great source of nutrients, and not just through fish. Cameroon, where Miller once worked as a community health trainer, surfaced as a cold spot for colon cancer. In the tiny village of Ntui, she encountered a complex, delicious indigenous cuisine of stews flavored with vegetables, legumes, grains, peanuts, and spices. Wild game meats are used sparingly, and fermented foods such as sour milk, relishes, pickled meats, and fermented grains are plentiful. Wild foraged greens and fats made from whole foods are a common feature in the diet. “In Cameroon, there are low rates of colon disease in general and colon cancer. We tend to focus on fiber as an important player in preventing these diseases. But in Cameroon, the traditional diet suggests that there are also other important factors at play. For example, they use meat as a spice, and their diet is rich in antioxidants through the leafy greens in their diets. They use small amounts of unrefined oils, which are made through rudimentary pressing techniques. Lots of their foods are fermented and are rich in probiotics. There is research looking at the importance of probiotics in colon disease,” says Miller. The last leg of Miller’s journey was Okinawa, Japan, a cold spot for breast and prostate cancers. She met beautifully preserved older Okinawans and delved into markets with a rainbow of colorful fruits and vegetables such as yams, squash, cabbages, greens, papayas, and melons. Miller observed that people drink three cups of green tea per day. A variety of sea vegetables, fish, and soy foods are staples. And surprisingly, pork is popular.